A car bomb in the Somalia‘s capital, Mogadishu, has killed seven people and wounded several others, police say. The bomb that went off on Thursday was in a car parked outside a restaurant near a checkpoint manned by the presidential guard regiment. “What we know so far about the attack is that a car bomb blast targeted the busy Dalsan restaurant, killing five people, including soldiers and civilians,” Adan Ahmed, a police officer, told Anadolu news agency by telephone. 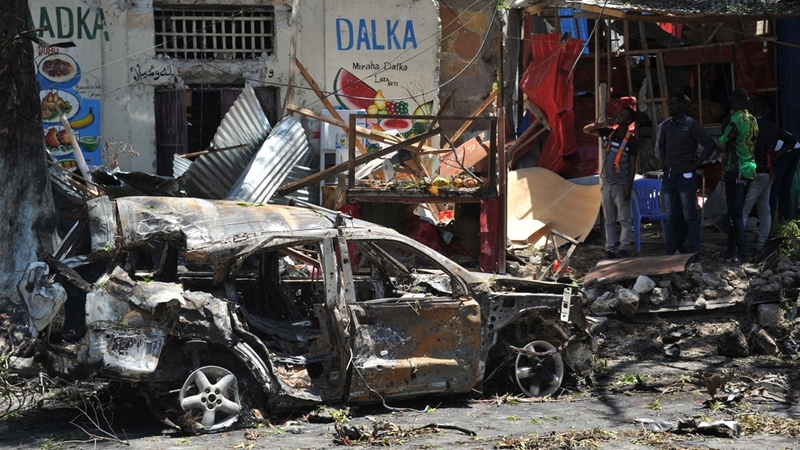 The blast “was caused by a car loaded with explosives, we perceive that it was parked near a restaurant along the road,” Somali police official Ibrahim Mohamed told AFP news agency. Al-Shabab claimed responsibility for the attack, which happened in the vicinity of the presidential palace – an area with some of the highest security in Mogadishu – saying it had targeted government officials. The blast is the second in less than a week, following another car bomb last Thursday, which killed 29 people, mainly civilians. Al-Shabab later claimed responsibility. A gun battle followed the March 1 attack, shutting down parts of Mogadishu. Somalia has been plagued by violence since a civil war began in 1991 but the country has stabilised somewhat in recent years. Al-Shabab has been fighting to dislodge Somalia’s Western-backed government, which is protected by African Union-mandated peacekeepers. The armed group controls large parts of rural, southern and central Somalia and continues to carry out high-profile attacks in Mogadishu and elsewhere. Since 2017, the United States has dramatically increased air attacks against al-Shabab since President Donald Trump took office. The US military command for the African continent reportedly carried out 50 air raids in Somalia in 2018. The number appears to be rising this year, with the military command in Africa reporting 23 raids as of February 26.